The Brussels Attacks – Another False Flag? Three explosions killing 34 people. Some 200 people were injured, according to early reports. Two detonations at Brussels Zaventem airport, one of them the police said was from a suicide bomber, the sign of a Muslim Jihadist – naturally. Witnesses also reported shooting and ‘yelling in Arabic’. First count dead toll resulted in 14 people killed at the airport. Another explosion in the metro station Maelbeek in the EU district, close to the heart of Brussels murdered 20 people and injured 73. Another False Flag, a western fabricated terror attack? Soon the police might find one of those conveniently lost passports or IDs, from Syria, Iraq or Yemen, or another one of those terror-spreading countries the west is trying hard to bring under control? All to justify in Europe more police state, more military clampdown – the educated western people – or western educated people (you figure out the difference) – will not only go for it, they will ask for it. Fear is the name of the game. The public must be kept in the dark, ‘to facilitate the investigation;’ lest contradictory reports, as there usually are in false flag operations, may plant doubt in people’s minds. That must by all means be prevented. Surprisingly, Sputnik news reports without questioning that Daesh / IS has already claimed responsibility for the blasts – and that the attack came just ‘days after Salah Abdeslam, the [alleged] mastermind behind the November Paris Attacks, was arrested in Belgium’. Could it not be a constructed coincidence? A make-believe? A further dulling of the public’s minds? – How come, official government statements are taken for truth without further research or investigation, even by the so-called progressive media? Did anybody see and analyze the Daesh claim? – Did anybody look into the guilt of Salah Abdeslam? – And if he is indeed guilty, who was behind him, who ordered him? – We need independent sources to analyze these horrendous allegations that people without questioning believe.The traditional CIA-FBI and local security forces are not reliable; they work on orders; they have their screenplays mapped out. Of course the Government would not let anybody independent access their ‘files’, the documentation of the facts and research the crime. The people must request independent access to these data. France’s President Hollande, even using the pretext of last year’s two ‘terror attacks’ in Paris, has so far been unable to gather enough votes in Parliament to enshrine the permanent State of Emergency in the French Constitution. Is this a benign sign of waking up? After this Brussels attack, it may be a walk in the park, a no-brainer, a given – to push this constitutional amendment through the French legislators; not even ‘push’, it will likely just ‘glide’ through. No doubt in Belgium too. 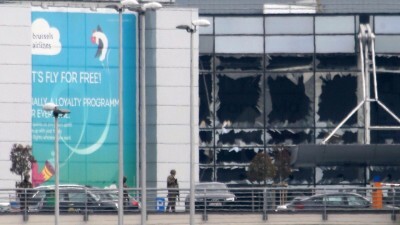 This Brussels horror attack is a double-whammy for the instigators. It may convince people becoming increasingly more doubtful, and – Brussels being the headquarters of the EU – it may give the ultra-ultra neolibs of the EU Parliament and EU Commission an extra boost. Interesting – how two neoliberal and neo-colonial neighbors, pals in extracting their fortunes in West Africa, can cooperate when it goes to achieving more evil objectives. People are being killed. There is no mercy. Even ‘their own’. The Evil empire delivered already multiple examples. And they keep coming, as we watch in awe. There are no scruples for killing for a specific objective: global dominance over resources, people — and money-money-money. Fear is the name of the game. People blinded and in the midst of fear – under the shock, accept any doctrine – more police protection, ‘we give you our civil rights and remaining ‘freedom’, but please take care of us.’ Military regimes will be installed at the demand of the people. Where and what horror will be next? Germany – Berlin, Munich, Frankfurt – or rather a lesser known place needing attention? To what are German leaders amenable to please the Masters in Washington? – Or else, Vienna and Geneva may be candidates, the homes of the UN and UN agency headquarters. Geneva, hosting currently the ‘Syrian Peace Talks’ might be particularly attractive for the ‘Jihadists’. It would give Washington and their vassals more arguments to invade Syria, Iraq, Yemen, to fight the very evil people they have created, trained, funded and armed – and to bomb what’s left of these countries into oblivion. Fortunately, there is Putin and Russia. Russian people have time and again brought sacrifices to save humanity, intervening for peace, far beyond protecting their own borders. A recent example is Syria; seventy years ago the Soviet army crushed Hitler, ending WWII on the Continent. This low-horizon high-caliber world elite keeps using the same pattern of aggression and the same lie-propaganda justification for their aggressions – and the people keep falling into the same trap. Will there be no stopping until the monster itself is stopped? Only a people’s revolution can do that. We are far from it. Consumerism and oblivion for comfort has made the western world brain-dead, literally. Does humanity need a bloodbath to wake up – or is there hope that truth will reach the conscience of individuals who then bond in expanding solidarity – in such a way that policemen and women, as well as soldiers will start recognizing that they are used by this elusive group of elitists, the cream of the crop of humankind, the chief manipulators of the universe, as mere cannon fodder, or at best, as slaves to defend their obscene wealth and power? Will they eventually wake up to the fact that they are part of ‘Us, the People’ – the 99.99% whom they are ordered to crush and crush again, whenever they, the movers and shakers behind the Empire of Chaos feel a looming danger? When that happens large scale across the globe, and in rare and isolated cases it did, hope for change towards a peaceful cohabitation of nations and people may be on the horizon.